Fall is nearly here, and that means it’s time to unpack your favorite sweaters. If you’re looking for a new addition to the stack, though, you’re in luck. Legendary rap group Wu-Tang Clan have just announced a very limited release of a blue and yellow knit sweater. It’s about time rap got cozy. 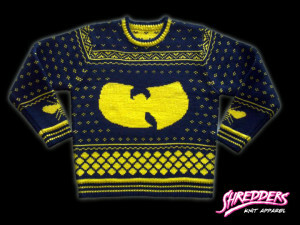 The “36 Chambers Knit ‘W’ Sweater” is made by Shredders Knit Apparel, featuring a blue and gold version of the group’s classic logo as well as two awesome killer bees on the sweater’s arms (in reference to the Wu-Tang off-shoot responsible for 1998′s The Swarm). It runs in sizes S, M, L, and XL and is available for pre-orders now right here for $79.99. Let us know if you order one below! And don’t forget what they say: Merry Christmas to all, and to all a thug night.